Before August 14, 2009 many Nigerians knew the 32-year-old Alhaji Abdurrahman Musa Bashir as a self-made billionaire and one of the successful young gladiators dominating the oil and gas sub-sector in Nigeria. As an influential member of the billionaires club in the country, Rahamaniya was almost synonymous with opulence, class and flamboyance. The oil magnate's sphere of influence didn't stop at the corridors of power, as his constant hobnobbing with cabinet ministers, state governors, national lawmakers among other influential power apparatchik remains an open secret. He was also the darling of most of the biggest banks in the country. He dines and mingles with bank chief executives with all ease and wanton respect. Rahamaniya was a pro bono client whose name rings a bell in various bank board rooms. To various bank chief executives, the young billionaire's wish, whose annual turn- over was placed at over N1 trillion, was law. To many people in Sokoto, Rahamaniya's home-town, he was a philanthropist to beat, as he has carved out a niche for himself in dishing out financial favours with reckless abundance. By now, most of them may have started feeling the effect of his on-going travails as the convoy of trailer-loads of rice, sugar, grains and other food items may not necessarily be heading to Sokoto for onward distribution to people as the billionaire's gift for Ramadan. This development may also not augur well for his over 5,000 staff at the Rahamaniya Global Resource Limited nation-wide, which salary per month is pegged at over N56 million with a minimum wage of N100,000.00 monthly. Same thing applies to several bachelors in Sokoto that may be jittery as they may not get his sumptuous contribution when they are getting married. In the same vein, several five-star hotels in Dubai, United Kingdom, United States, China among other countries he often visited for business and leisure, may likely miss an important client, who jets around with the company of not less than 15 people. It is clear that the flamboyant billionaire is in trouble over N43 billion non-performing bank loans. The 32-year-old Abdurrahman was born in Sokoto. His father, Alhaji Musa Bashir, was a local Sharia court judge in the ancient city of the Caliphate. His brief sojourn in western education, according to Sunday Trust investigations, all started and ended in Sokoto. He was admitted as a pupil into the College of Education (COE) Primary School, Sokoto and later on proceeded to Ahmadu Bello Academy, Sokoto for his post-primary education. It was after his post-primary education that he was admitted into Sokoto College of Arts and Science (SCAS) for a diploma course in Accounting and Business Management, though Sunday Trust findings revealed that he did not complete before he finally dropped out. Sunday Trust gathered that the oil magnate continued thriving with his local businesses in Sokoto and its environs before he finally got involved in oil business where his fortunes suddenly prospered in bounds. His foray into oil business Abdulrahman made his dramatic entry into oil and gas sub sector when he was employed by a northern–based businessman and oil mogul, A. A. Rano. Within a short time after his employment, the young man was already engrossed in the business to the extent that his boss, A. A. Rano, started sending him to Lagos and Port Harcourt to secure petroleum products for his several servicing stations across Northern Nigeria. His business acumen and skills, another business associate, who didn't want to be named, was seen in “his ability to secure petroleum products even during shortage had, in no small measure, endeared him to his boss and even other independent petroleum marketers based in the North. His ability to procure the product, at times numbering more than 100 tankers at a time, even a t the peak of scarcity through sources other than the Nigerian National Petroleum Corporation (NNPC), made him a household name in the oil business in the North, and particularly among the oil and gas magnates in Lagos, Warri, Port Harcourt, among others. It was in the course of procuring petroleum product that he came in contact with Zenon, an oil company owned by oil and gas billionaire, Mr Femi Otedola. “Abdulrahman made his mark when he met Otedola, another billionaire that made name in oil and gas importation. He was purchasing the product from his company and Otedola was making it possible for him to earn some small fortune from the small subsidy he got from him,” the associate said. Abdulrahman decided to become independent, Sunday Trust gathered, as a result of the volume of transactions that was taking place in his various bank accounts. “It was evident that the young man was doing well by virtue of the turnover in his banks accounts. These independent marketers in the North did send him money, ranging from N20 billion to N50 billion to buy fuel for them. Therefore, there was a lot of business activities taking place in his accounts running into hundreds of millions of Naira. Naturally, the banks were enthralled by that development,” the anonymous associate told this reporter. That was why even when Abdulrahman went autonomous and registered Rahamaniya Global Resources Limited as a private business, funds were never his problem, having established a huge financial profile with Oceanic Bank, courtesy his huge bank accounts. His business empireAfter he secured the oil import licence, his business empire started to expand in leaps and bounds. His banks, also did not find it difficult to finance all his exports. His clientele portfolio that included constructions firm such as the PW, Sokoto Cement, NITEL, among other multinational corporations continue to develop like his bankers. Within the last six to seven years Rahamaniya was already a domineering oil firm rubbing shoulders with the spheres of Zenon and its contemporaries. His recent establishment of a tank farm worth over N2 billion in Lagos was evidence that the businessman has come of age in the oil and gas sector, his associate said. “In fact, he is considered by many as very lucky person. It was not easy for an obscure Northerner from Sokoto to come to Lagos and establish a depot in Lagos alongside big time oil magnates without a godfather. “Rahamaniya now has more than 500 tankers, 26 filling stations across the country, five vessels worth $7 billion each operating and a tank farm that earn him close to N400 million monthly. This is not to mention his other businesses that included real estate development,” he said. His flamboyance and philanthropyWhile his business grew, his taste, flamboyance and philanthropy also develop. Apart from riding on expensive porch cars, the young billionaire also carved a niche for himself in frequenting five-star hotels whenever he travels out to Dubai in the United Arab Emirate, UK, US and China. “His lavish life style is an open secret. He moves around in company of not less than 15 friends even when he travelled out of the country and they all lodged in the same expensive hotels,” said his associate. Like his flamboyant lifestyle, Rahamaniya, as he is now known, is also a philanthropist to beat. “His trailer-loads of rice, sugar and other grains are common features in Sokoto. He distributes them to people lavishly. He has been sponsoring more than 100 people per annum to Mecca to perform Hajj. This is apart from the several mosques and Islamic schools he built across the state. “Many people in Sokoto were made to believe that he is the richest person in the state because of his philanthropic activities. He is equally a darling of the youth by offering financial assistance to many bachelors interested in getting married. The less privileged are not left out as he visits hospitals and settle hospital bills. This is the philanthropic part of Rahamaniya,” the associate told Sunday Trust. How he got into troubleWith a turn-over of over N1 trillion per annum, all seems to be well for Rahamaniya. His problems started with his losing of several billions in the stock market during the recent financial meltdown. “His stocks which ran into billions are meant to be servicing most of these debts. Unfortunately, the stocks crashed and the stocks which was in two billion digits was reduced to a mere, very small one digit number. That really contributed to his present predicament. “Also, he has been having a running battle with Femi Otedola before the latter's problems with Aliko Dangote. He has been contending with all sorts of sabotage from the big time players in the sub-sector. They consider him as a small boy bent in rubbing shoulders with them. He has to be taught a lesson. And they are doing it now,” his associate said. His celebrated attempt to marry one of the presidential family, this reporter learnt, is not unconnected to his travails. “He showers the president's daughter with gifts worth several millions of Naira. In fact, he is a reckless spender. No wonder he is into this mess,” said his associate. The banks, according to findings, are part of the young billionaire's problems. “One thing is that the banks have been lending him money based on his status in the society. This is because a substantive part of the funds go back to the banks as one charge or the other or as PR to bank executives. “It is evident that virtually all documents of his choice property in Abuja, Lagos and Port Harcourt have been with his debtors as collaterals. Some of these bank executives are in trouble today because they look the other way. That is how the oil business is run in this country,” added our source. 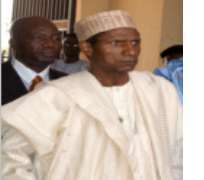 What his lawyers sayThe over N28 billion the billionaire was said to be owing Oceanic Bank as non-performing debt, according to his counsel, Abubakar A. Malami, SAN, “is not the facility in its own right, but a composition of losses, excess and spurious charges, interest as well as amount due and anticipated from PPPRA which is yet to be paid. “The excess, spurious and illegal bank charges that our client was subjected to amounted to N4,017,116,856.67 in addition to interest charges in the sum of N486,671,212.30 debited from our client's account all in breach of the prevailing Central Bank of Nigeria Minimum Rediscount Rate as enshrined in Section 3.2.4.g. of the Monetary, Credit, Foreign Trade and Exchange Policy Circular No.37 of January 02, 2004,” his counsel said.